A game to be appreciated. If you are an avid Nintendo fan, and you have an SNES, then you need to get this game. Yoshi's Island shows a lot of evolution in Nintendo's oldschool games. Although it is nothing like it's predecessor, a.k.a. "Super Mario World," it still manages to maintain the feel of a traditional Mario game. Yoshi's Island has a unique array of boss characters. They each have different strengths and weaknesses, and there are two per world, which should make for an interesting challenge. Although, in my opinion, they are quite easy. Something else I like about Yoshi's Island are all the different enemies; there are dozens! Each one is unique as well, and adds a lot of diversity to the game. The graphics are some of the best I've seen for the SNES. While they do look a little cartoony, they look like wonderfully hand-drawn canvas pictures. The paralax scrolling is nice as well. The music for each level is extremely catchy, like the jungle theme. The story is also interesting; it takes place when Mario is a baby, and your mission is not to save Princess Peach--it is to save Baby Luigi from Kamek and Baby Bowser! Ladies and gentlemen, this is IT!!! The ultimate Mario game! The *ultimate* video game PERIOD! There is *so* much to do in Yoshi's Island, whether it's collecting flowers, stars and red coins in an attempt to aim for a perfect score, or the mini games flooded through each of the six massive worlds (such as roulette, card match and slot machines to name a few) this is, without a doubt, the most exciting Mario game ever. Thought Super Mario World was big, didn't you? That game looks microscopic compared to Yoshi's Island. As I mention above, trying to get a 100% score in every level is a MAJOR reason the game is so much fun, because you have a reason to replay Yoshi's Island over and over. In some levels you may be left wandering around for a long time until you find all the red coins, flowers and stars. If you ask me, any one of the levels in Yoshi's Island is TWICE as long as the ones in Super Mario World, and probably three or four times bigger than the ones in Super Mario Bros. 3. Nintendo really went out of their way to bring Mario fans the biggest adventure yet, and the funny thing about the game is how it didn't receive as much attention as you'd expect when it hit stores in 1995. The levels in this game are positively PACKED with TONS of goodies. Flowers, stars, coins, 1-up's, enemies, P-switches, you name it. The thing that amazes me is that 10 years after owning the game, I'm STILL finding more of those invisible floating clouds (usually containing stars inside). There must be THOUSANDS of those babies! Speaking of babies... CRY CRY CRY!!! Yeah, Mario is PRETTY darn annoying but you have to remember he's just a baby! YOU were crying like that, too! You have to forgive him. Cuddle him and be thankful YOU don't have to raise this child! The only problem is that the music could have been better. It's not bad, I mean, it SOUNDS really good, but most of the themes don't really impress me. They're still pretty catchy (you will remember them after you turn off the game) but... I don't know. Just not the kind of music you'd expect to hear in a Mario game. It's like Nintendo wanted to progress the typical Mario themes into something bigger. Actually, the music is like a soundtrack to a children's book. The challenge is excellent (which means "just right"). One of the hardest Mario games to date- you will be playing this game for a long, long time. Trust me, you'll WANT to dig in and replay this bad boy over and over because of the amount of fun it offers. The challenge isn't in reaching the end of the level. It's in trying to get a score of 100% in every level. Yoshi was just starting out in the original Super Mario World and Nintendo weren't entirely sure what kind of things they wanted to do with him. Look how much Yoshi has improved in this game! You can jump on enemies, stomp on enemies, spit enemies at other enemies, turn enemies into eggs, and shoot eggs with a sliding target thing (it's hard to explain but it will make perfect sense once you see it). You can also aim your tongue upward, reaching for things above you (including baby Mario when he floats away). You control Yoshi throughout the game which explains all the new things he can do. This game is just incredible. Please pick it up. You won't regret it! I've played Yoshi's Island a lot and, thanks to TONS of practice, I've become pretty good at it (I STILL can't get 100% in every level though, but that's a pretty difficult task). I have to say the final boss battle with Bowser simply blows my mind. I simply LOVE shooting eggs at him while having to jump around on tiny rocks. A fantastic battle. You get to use Yoshi's tongue as a weapon ,making for some completly different levels disigns.48 levels may not sound liek alot ecspecially since SMW had over 80.These levels are alot longer and much more colorful.The music is fantastic and the graphics were a pastel/crayon look making it look as though a child had colored it in. Some items you can obtain are watermelons and use their seeds as a gun liek weapon.Some melons are for flames,and others for ice.The bosses are are each unique and span out from all the zones in the game.There are 2 types of bosses a mini boss thats halfway through a zone and a full out boss they are in a castle of some sort at the end of each zone.Really good game controls are easy enough the scoring system is awsome for perfectionist. I love this game. Whenever I play it, I will not move on to the next level until I pass it with a 100%. You must find all 20 red coins(1%each), 5 flowers(10% each), and keep all 30 stars(1% each) To me this is what the game is all about, it is a treasure hunt. I think there is enough variety in the different levels and stages you could play this game many times and still not remember where every item is, allowing you to keep that feeling. It is still quite challenging to complete some of the levels, and that keeps me coming back for more. I love the music that plays when you fight some of the bosses, gets you pumped up! I have had this game for several years now, it was actually one of the first ones I ever had. Being a non-avid player myself, I'm not sure how it plays out at the end, for I have little time to play games often enough to defeat it. Contrary to a review below, this game does not require a turbo controller or gun, and if their game does then I do believe they are playing the wrong game, or atleast reviewing the wrong one. The object of the game is to nab the baby mario which has been stolen from you by the big boss guy (can't remember which one he is, but I'm sure it hardly matters.) You go through a series of mini-levels that must be defeated in each world. Each level you try to collect the red coins, the flowers, and the stars for bonus points to clear the level. A lot different from SMW, but just as great ! (...) Instead of Mario and Luigi being the stars this time around, a group of Yoshis are the main characters. Baby Luigi has been kidnapped by the all-mighty Bowser, so it's up to Baby Mario and Yoshi to try and rescue Baby Luigi. That's right, Mario and Luigi are babies in Yoshi's Island. And there's not a princess to rescue for once. 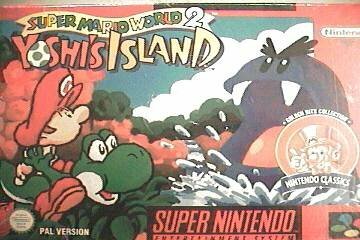 Yoshi's Island includes 6 huge worlds that are loaded with many unique and interesting levels. There are 10 levels in each world. Each world has a mini-boss and a major boss that you must track down and defeat. (...) All you really have to do is get to the end of each of level and defeat all the bosses in order to beat the game. On top of all of the fun gameplay, you can also add great graphics, sound, control, and replay value to Yoshi's Island's list. Just about every environment in Yoshi's Island is a treasure to look at. All the characters are well designed, and the backgrounds can range from crystal caves that flash, 3D-looking mountains, to eye-popping waterfalls made of water or lava. As for sound, most of the sound effects are cartoonish, but well done. Many of the music tunes are catchy, and none of them are bad. Control wise, Yoshi's Island is very easy to control. The controls aren't sluggish or overly responsive; it's easy to do anything in this game. Finally, the replay value and fun factor are top notch for Yoshi's Island. The six years I've owned Yoshi's Island, I've started from the beginning, went all the way through the six worlds' levels, and beat the game several times, and I still haven't got tired of playing it. And I don't think I ever will! This game is THAT fun. I find it odd that I would give this game a higher overall rating than fun rating, but I feel it's appropriate. This game is beautifully made, with excellent graphics, levels, and play control. You can't ask for anything more. The only problem with the game is it's too easy to beat. This doesn't make the game any worse, it just makes it less fun. Fortunately, even long after you beat the game, you can go back through it and try to get a score of 100 on as levels many as you can. It's an extraordinary challenge that I have yet to complete, even after years and years. GREAT! GREAT ! AND GREAT! I remember playing this game growinhgup when I was inbetween the age of 5 and 13 I rented this for about a week. I only got to the Pirahnha Plnat boss. I though along with Super Metrioid in was on of the harder Super Nintendo games to master. If you were a novice at mario like I was. Here are boss statics and startegies froma speed run on you tube recently posted. This was done use tool assitance like slowly the game speed down and like saving possibly more frequentylu than normal. The real game may take you longer or more than about 103 minutes or less to complete excluding the credits. But here are some startegties for most of the boss battles. I may have left out one battle before baby Boswer when you might have to fight the evil Kopa Magican that kidnapped bady Lugi and appears in ever boss stage making the enemies bigger most of the time. IF you don't want this assitance than close the website and find out on your own I only have about 9 minutes until my class. Yoshi Island Sattics. first boss enlarge has 1/6 damage resitance against egg shot attaacks. Next boss shot with and egg until it splits up enough to the poin that the enlarge yoke is destroy this guy I think shout multiple eggs at the same times the exact damagage resitance is not clear because he does it so fast. The Next boss is and enlarged boo using magic the evil minion of Baby bowser enlarge it. Hit him with five eggs each hit he will expand after the fifth eggs hits he will explouded and be reduce to endoplasimic goy d one in the box we be fast he be slow! (A alternation of a quote from ghostbuster 2"
Four forth boss it is simple all you got to due is push the jar of the edge by applying more pressure than the shy guys that are try to push it back from the center of the platform. This was a toll assited run some you maye have to do it more than once in the real game with out enhancements to defetas this boss but that is the general method for defeating this boss. 27 minutes into this video will continue after second appoint ment with Jannet gets done around 2 because next appoint is not until 2:45 its only about 2 to 15 minute walk or run. Going to play yugio don't think I can beat the arcade ninja turtles in under 15 minutes yet not good enough at dogging and countering yet. For the fifth boss the frog instead of making the frogg bigger the evil Koopa that captured baby Lugi and failed to get mario shrinky uo the frog swallows you. You must go inside while doggin the dijest juice hit the gage relexflex with six jumbo size eggs it will flash when hit the boss is defeated you are pulled down the and come out of his but. You will grow to your original size and the frog will be standing there back side up like a beached turtle. Got to go sending the next boss which I think is the enlarge Pirahan plant later. Total damage resitance 1/6 for the frog not sure for the egg yoke boss was done to quickly. This game is slowed down in parts and saving is done more than usually due to reduce speed and auto or save more often emulator code. About 35 minutes into the video minus about 17 to 45 seconds of rewatching. This guy super cheat at the pirhan plant boss taking it down befor it grow to about size of a full grown naudrey II maybe large. I think he used a push a button to drain energy cheat kind of like the drain boss health with vital which they had on the megaman collection cheats up until the cheats were created four number five or six than they did away with it. Here the really way to beat the Pirahan plant if I remember correctly it grows bigger tries to attack you there is like a sticker with like and X down near the bown of the plant near its root. You got to shot the egg of the wall and across the water at certain angel you due it right it will hit and plant will flash I think about 2 - 10 time you have to repeat this process with out loosing baby mario. I higly recommend get the starts they increase counnt down time if you are hit so you can rescue baby mario before he is grabbed and taken away you have to repeat from last stage over again until you get through the whole stage with out baby mario getting capturing they also give you a higer point score for the stage you can use your points to by two items per area if you get a certain score.. I belive the max time he can stay of before being captured is about 30 second unless there is a cheat to increase that. I am about 53/103 the way done with I am past the Pirhana plant the next ball is some kind of dust ball or something like that. To defeat the this bost ground pound it six time each time it will break up into smalller dust ball after six time it is defeated you have three stage to go before the next boss. The player is about to enter the next boss castle. I am getting of in about 2 to 5 minutes so I am going to fastfoward to the boss then I am going quick email my best friend. Which is a giant turtle. Hit it with 4 egg and another four hits using those ground pund attack this boss goes down. I am about 59/103 of the way done due to fast forward about four minutes plus about 2 minutes to watch the boss fight maybe less. To beat the slug it it has 1/10 ressitance against hit it ten times it will exploud. I am now 65 minutes into this due to 6 minutes of fastfowarding because I only had about 12 to 25 minutes to class started. To defeat the enlarged raven that you fight on the moon hit with three ground pound attack these will send sock waves through the moon or bring up some short of post that will hit it it has a weak 1/3 damage resitance do this move correctly three times it goes down. 75/103 about done with this will post other statistics later. This boss has 0 percent resitance dfeat him the same way you defeated the first Koopa kids in super marion on. Break enough of block with out you falling in the Lava will do in this giant porcupine like boss. I am now 84/103 done with this speed run the static will probably be posted withing the next 11 hour 58 minuntes maybe less. I have three minutes to get to the next boss mninus ten to wait in the loby so I wont me marked trady. The final boss fight with bowser has 1/10 damaga resitancte ground pounbd three times when kid bowser is small it will send a shock wavd due it correctly it will hit he will flash them his wizard maske him grow bibbger than hit him with 7 bigger eggs froma distanc ehwild doging the flying builders the destroy the platform hit him 7 times there mwill be the explosion effected he will shrink and take off them you free baby Lugio and the stork and congrulations you have just beat Super Mario world II Yooshi's island.